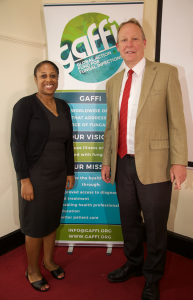 GAFFI has elected to appoint Professor David Denning as its Chief Executive and Ms Emma Orefuwa as Chief Executive – Kenya. David has decided to take a more active role in implementing GAFFI’s strategy. He will now take the role as Chief Executive, which he combines with his clinical, research and teaching work in Manchester at the National Aspergillosis Centre and The University of Manchester. Emma brings with her 14 years of Public Health Program Management experience and has worked extensively in Africa, Asia and Europe. She holds 2 Masters degrees (Biology & Control of Disease Vectors and Public Health) and has spent the last 3 years working as a Strategy & Operations Consultant and Programme Manager at Connecting Organizations for Regional Disease Surveillance (CORDS) France. Prior to this she worked for the African Foundation for Development (AFFORD UK) and AMREF Health Africa UK, managing multi-country diaspora engagement and maternal, newborn and child health improvement programs in East and West Africa. In 2009 she co-founded the Pan African Mosquito Control Association, the first African-led organisation of its kind, comprised of medical entomologists from 24 African countries working together to tackle vector-borne disease. She brings remarkable program development and management skills in African and multi-cultural contexts to deliver the FIP-Kenya diagnostic program – a multi-organisational and multi-disciplinary programme with several partners. To support the new Chief Executives, GAFFI has also further strengthened its governance. Professor Nigel Lightfoot has been elected as Chairman of both GAFFI and GAFFI UK Boards and the 2 boards are now identical, with Victor Rydgren elected as Deputy Chairman. Several new Board sub-committees have been formed to streamline preparatory work for the Board. GAFFI has delivered a number of material and important shifts in the perception of fungal diseases in collaboration with numerous partners worldwide which are chronicled here: “Our Successes’. GAFFI now has Ambassadors in 51 countries, a stellar Senior Advisor group and a strong executive team. GAFFI issued its 10 year Roadmap ’95-95 by 2025’ in 2015 calling on all governments and international health agencies to ensure 95% of the global population have access to fungal diagnostics and antifungal therapies by 2025: http://www.gaffi.org/roadmap/ GAFFI has enabled several antifungal drugs to be listed on the World Health Organisation’s Essential Medicine List and key diagnostic tests to be listed on the WHO Model List of Essential in vitro Diagnostics.